For use on perfect fit surfaces where a fast set is required. Bonds non porous surfaces eg most plastics, metals, glass, PVCu. High viscosity for a delayed set, and medium viscosity is for a fast set. 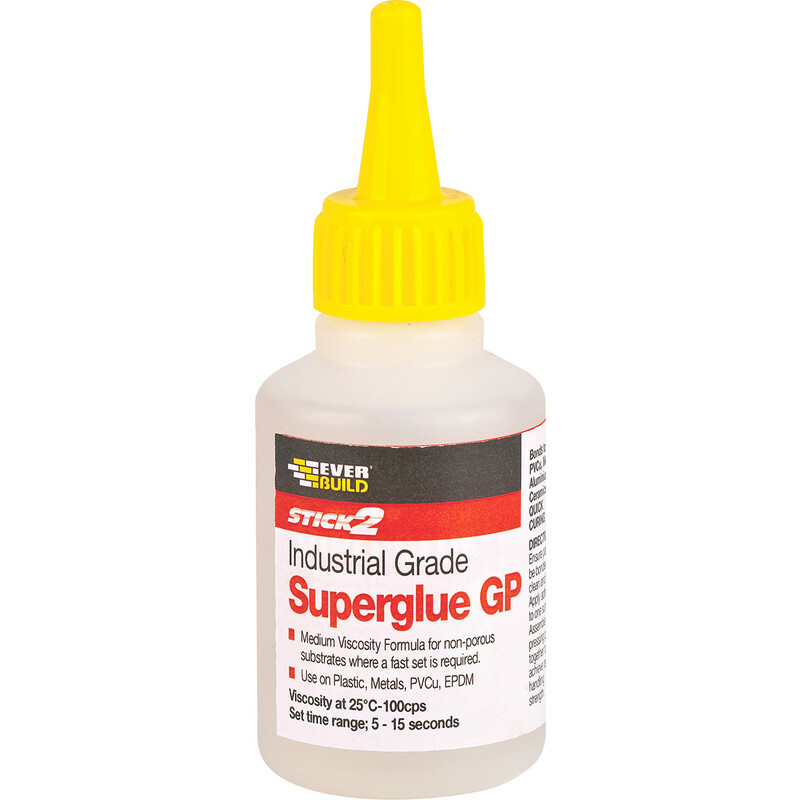 Superglue 20g Med Visc - Thin is rated 4.8 out of 5 by 69. Rated 5 out of 5 by PAUL 2307 from DOES THE JOB EASY TO USE PRODUCT.,VALUE FOR MONEY. Rated 1 out of 5 by BristolPete from Good for what it's designed for Remember superglue was designed to bond skin to skin in a war context. Sadly in my experience, and certainly with this product, anything else is whisful thinking. Hard to get to bond, and then a very brittle low impact only bond when it does. Rated 5 out of 5 by Peaksnplains from Effective and good value Does what it's supposed to and at a good price compared with the branded product I have used previously. Rated 5 out of 5 by A Frowd from Works Very Well To Remove All Adhesives I purchased this item to remove adhesive from a glass window pane and found it to work extremely well leaving no strace of any adhesive behind. Rated 3 out of 5 by onetruth from Good, but doesn't keep for long. This is my preferred brand of superglue, mainly because of the price. It bonds well and reliably, but the HV version does not keep well on the shelf. I needed some HV for a job the other day, all four of my bottles (three unopened) had gone solid. Never had this problem with the MV, which I would rate 5 stars. I still use this HV, but now only buy a single 20g bottle at a time, where as I stock up with several 50g for the MV. Rated 5 out of 5 by teho from Extremely good value and sticks to PLA This is really good CA, especially when used with the activator spray. The bottles have got over 3x more than similar products on the market at greater cost. I've used it when 3D printing with PLA filament and despite comments on the internet about nothing sticks to PLA very well, this stuff does. Rated 5 out of 5 by hotelcharliekilo from Brilliant What a life saver. This product has been great for cleaning super glue from the work surface and unsticking fingers.